Lighting, Extremely Critical So Don’t Mess It Up! Nothing breathes life into a room with the impact that the right lighting does. Choosing your lighting is part science and part style. Having your Karr Bick designer by your side will make lighting selection fun and ensure that your room shines. Let’s cover the science part first and then move on to the fun stuff. Color temperature is measured in kelvins. The higher the kelvins, the cooler the lighting effect. Lumens and lux measure the output of the light fixture and how that light hits at a certain point on a surface. Why do you care? One visit to a clothing store dressing room with bad lighting and you know why you want the right color temperature and intensity in the space you live and breathe in every day. When you position a fixture, the light spreads out like a cone. Cabinets, countertops and people can get in the way and cast shadows. This is why it is so important to have several kinds of lighting (ceiling, wall, under cabinet, etc.) combined in your space. Using pendants over an island or bar area is a classic look. The pendants you choose can be simple or punchy. Either way, they will be a focal point. Try mixing different colors of the same shape pendant. If you have the room, several of the same pendant in a row can provide a nice repetitive accent to your space. Any time you are using groupings in design, it’s nice to use odd numbers, 1, 3 or 5 pendants in one spot for example. However, see what works in your space as rules are made to be broken at times. Cage lighting, sculptural lighting and lantern-style lighting can add just the right amount of interest and transparent weight when used above a long kitchen island. Use your lighting choices to play with finishes in your space. Glass fixtures can add high style with an airy feel and can also be used to feature Edison bulbs and other specialty bulbs. The glass itself can be clear, seeded, smoked…all subtle variations that customize your space. And although can lights have an important place, skipping the can above your sink and adding a stylish fixture instead will offer an unexpected statement. Dress up your mudroom with light fixtures that have an unexpected formality. Don’t forget your outdoor lighting as well. 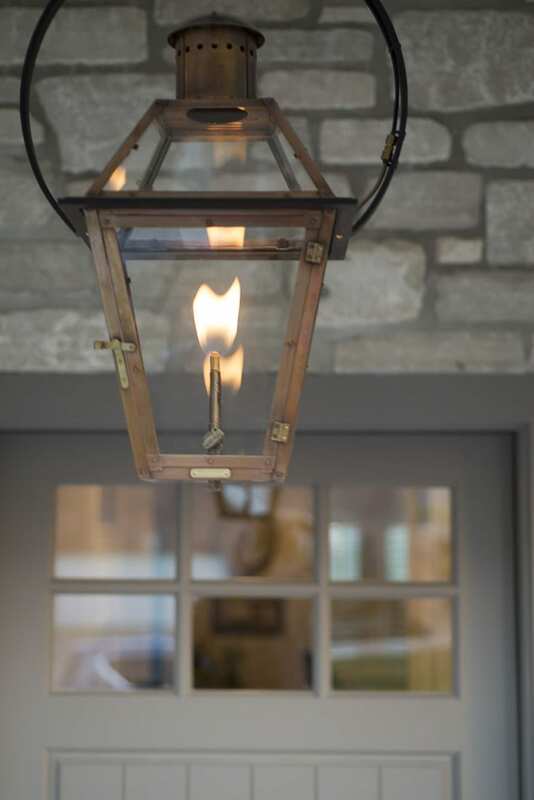 Nothing is quite as welcoming as the flicker of a gas-light fixture greeting guests at the front door or in your outdoor entertaining space. previous postThe Kitchen Work Triangle: Will It Work For You? Copyright © 2018 Karr Bick Kitchen & Bath. All Rights Reserved. Kitchen & Bath Remodel St. Louis, MO. Need help starting your Remodel Project? Take a peek at our funny & free video series that will help you create your own "nothing ordinary" space. In it you will find everything you need from Inspiration through Installation. There is no “one size fits all” approach to our work. If you are ready to explore the possibilities, come by the showroom or send us your information. Let’s figure out together, how we can make the difference in your project.